With job applications, our move to Florence over the summer, and the busyness of settling into a new city, J and I have hardly felt like we've had the chance to relax for the better part of six months. So back in September, I started planning J's Christmas gift--a fancy kid-free hotel stay where we could relax, eat a meal without having to entertain a toddler, and sleep late. Luxurious, right? There were a few boutique hotel contenders on my list for J, but the Bee and Thistle Inn* won out because of the intimate atmosphere created by offering only 11 rooms. The individuality of each room also caught my eye, and I had a difficult time deciding which room to choose as they are all so beautiful. The location is also great for exploring Old Lyme including the Florence Griswold House and Museum, which is right next door. Check-in to the Bee and Thistle Inn* was super easy and though we arrived early, our room was ready for us and we were encouraged to drop our bags off and get settled in before heading back downstairs for their Christmas afternoon tea. I had pre-booked us in for afternoon tea, which is only offered in the winter, as we never get the chance to linger over food (let alone sit down at all) with a toddler. Afternoon tea at the Bee and Thistle Inn runs from late November to mid-January every year and seatings are from 12 pm until 2:30 pm. 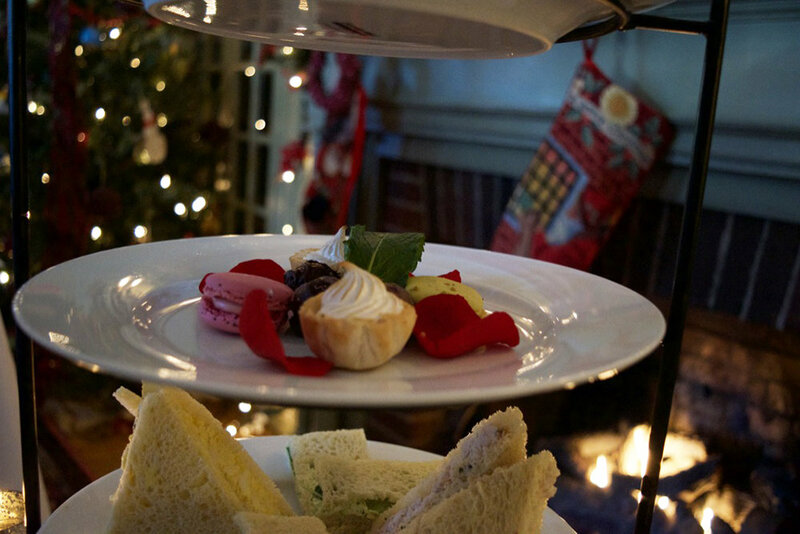 This special Christmas afternoon tea takes place in the luxurious lounges on the ground floor, which is decked out in Christmas decorations, garland, and a crackling fire. The tea was a selection of Harney and Sons, with unlimited cups. After receiving our steaming cups of tea, our three-tier tray of treats came out, with sandwiches on the bottom level, scones and cream puffs in the middle, and sweets at the top. For me, the sandwiches were the stand-outs, as the goat cheese and watercress was a lovely, flavorful combo; the cucumber and mint was light and delicious; and the chicken salad was lovely. J's favorite section was the middle, with scones and heaping layers of clotted cream. I loved that the afternoon tea wasn't rushed at all, and that we were able to slowly indulge in treats, tea, and conversation. We stayed in Room 3, which features a king-sized wooden four poster bed, purple velvet couch, and a walk-in closet. The rooms at the Bee and Thistle Inn don't have TVs, and it was lovely to unplug from the tube, turn on the fireplace (it was only 6 F outside during our visit! ), and read while being cozied up on the couch. Though their are no TVs in the rooms, the Bee and Thistle Inn provides free, fast Wi-Fi throughout the property, so you can check out social media, stream a show on your device, or catch up on work. J and I wanted to unplug though, and I think the Bee and Thistle Inn is especially wonderful for a romantic, quiet stay. Do note that children are not allowed to stay at the Bee, but they are allowed to dine in the restaurant or enjoy afternoon tea. Room 3--did I mention that I love that each room is so individual!--had a lovely bathroom decorated with vintage looking wallpaper, a bathtub and shower, and plentiful toiletries by Gilchrest and Soames were provided. I also loved the touch of a black washcloth specifically for removing makeup; I always feel horrible when I see black mascara stains on the typical white hotel towels! Another really sweet, luxurious detail of our stay at the Bee and Thistle Inn was the turn down service, which we didn't anticipate! While we were at dinner, our bed was turned down and we came back to freshly baked cookies on one of the bedside tables! I think I could definitely get used to staying at tiny boutique hotels specifically for their thoughtfulness! I also loved the addition of cookies, as I was feel very nervous the closer it got to Baby ISO's bedtime, as this was the first night I was spending without him. In my opinion, the Bee and Thistle Inn* would be a great escape for a writer needing a quiet and inspiring place to work with no distractions. I'd love to stay again (perhaps in the summer, so I could see the lovely grounds)--in room 2--and enjoy the silence while working or taking the chance to unplug. J and I had every intention of going out for dinner, but with the weather SO freezing cold out (and I was starting to feel very anxious about leaving Baby ISO for the night), we decided to make a reservation for the Chestnut Grill, which is the Bee and Thistle Inn's restaurant. And I'm so glad that we did end up dining at the Chestnut Grill as the food was fabulous and the waitresses were very friendly. Even though it was a frigid Thursday evening when we stayed over, the Chestnut Grill was packed, so if you do want to dine here (whether or not you are staying at the Bee), do be sure to make a reservation in advance. We had a seriously tasty meal at the Chestnut Grill. We opted to start with the cheese plate, which featured cheddar, goat cheese, and blue cheese, and came with crackers, dried cherries (I think), walnuts, and really delicious honeycomb. Combining the cheese with the honeycomb felt really luxurious. For mains, J ordered the scallops with spelt risotto and I chose the herb crusted cod with spelt risotto as well. My dish was meant to come with mushroom risotto, but I really don't like mushrooms and the waitress was so accommodating and had no problem swapping my side. And actually, the spelt risotto was really good. J also loved his scallops. Now, in all honesty, I was not able to fully appreciate my meal since I was so nervous about being away from Baby ISO for the night. I didn't even come close to finishing my cod, even though I would have devoured it on any other night... and probably ordered dessert as well. I was just too nervous to properly enjoy my meal, but it was very delicious and I hope to dine at the Chestnut Lounge again so that I can fully appreciate the great food. I'm planning on writing a blog post on the specifics of the first night away from Baby ISO, so if you'd like to read that, do let me know! I am thinking that the second night away will be easier, so perhaps a boutique hotel getaway is in the cards for J for next Christmas as well! One thing I always seek out when booking a hotel is a free breakfast. As someone who gets really hungry in the morning and needs a serious cup of coffee to fully wake up, I absolutely hate having to leave the hotel in search of food. This is why a great hotel breakfast is really key to my hotel stay experience. And the Bee and Thistle Inn* definitely spoiled me for future hotel breakfasts. A stay at the Bee and Thistle Inn comes with a complimentary breakfast buffet. This buffet consists of a small number of dishes, which I'm sure vary daily, plus a never ending supply of delicious coffee. On Friday morning, we went down to breakfast early and dug into beautiful pastries, a really delicious cheese and spinach quiche, and endless strips of bacon. It felt like a really luxurious way to end our wonderful stay. The Bee and Thistle Inn is located on 100 Lyme St, Old Lyme, CT 06371, USA. It is just off of I-95 and is situated next door to the famous Florence Griswold Museum. It is also convenient to reach Old Saybrook, New London, and Mystic from the Bee and Thistle Inn. Overall, this was my favorite hotel stay ever and I highly recommend it to you if you are looking for a unique, highly individual hotel experience. I loved every detail. Feel free to book your stay at the Bee and Thistle Inn by clicking this link*. What is your favorite small boutique hotel? I need ideas for next Christmas!